Every year, the Department of Health releases a report on the injuries that kill NYC children [PDF]. And every year, the grim statistics show traffic to be the single largest cause of injury-related death among kids. Between 2001 and 2009, 1,681 children under 13 years old died in New York City, 324 of them from unintentional injuries. Of those, 41 percent — 134 children — were killed in traffic crashes. Most of them were on foot when they were hit by a car or truck driver. “Unintentional motor vehicle traffic accidents contributed the most to child injury deaths in NYC overall, with more than three quarters of deaths occurring among pedestrians,” the authors write. The first report in this series focused specifically on traffic crashes, detailing specifically how motor vehicles kill New York City children. Last year’s report examined the massive racial inequalities in traffic fatalities; though 26.6 percent of New York City residents are black, black children make up 46 percent of all kids killed by cars. This year, the Department of Health expanded the scope of its research to include serious injuries as well as fatalities. Between 2001 and 2008, 4,944 children were hospitalized with injuries from traffic crashes. Again, most were walking when hit. Traffic crashes are not the leading cause of hospitalizations among kids — about twice as many are caused by falls. As preventable as these injuries are, and as much as these numbers need to come down, the rate of traffic injuries and fatalities suffered by NYC kids is lower than other American cities. Because New Yorkers extensively ride transit and walk rather than drive, child traffic deaths are three times lower per capita than the national average. New York’s far safer transportation system saves enough lives that it is the primary reason why the overall mortality rate for local kids is 30 percent below the national average. In addition to urging parents to buckle in their children properly and teach them to cross the street safely, the Department of Health repeated its call for Albany to authorize camera enforcement of the speed limit on dangerous streets. Legislation to that effect went nowhere in the state legislature this spring. I’m confused…. 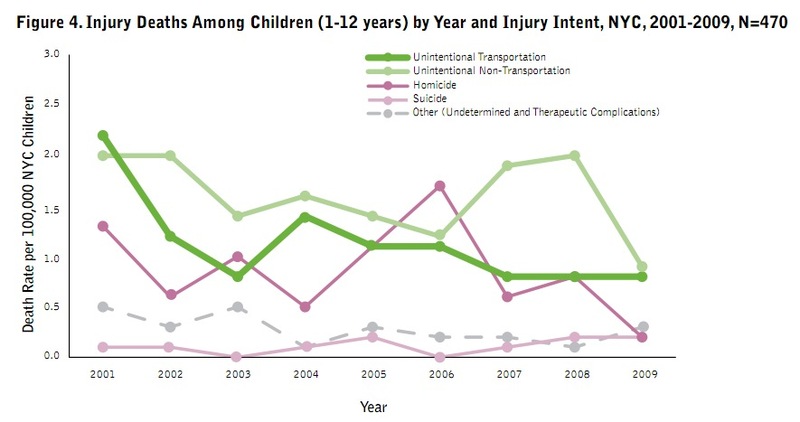 the graph above suggests Unintentional Non-Transportation mishaps killed children at a higher rate than Unintentional Transportation accidents. Can you clarify? Sure thing, Alex. The Health Department breaks out transportation injuries as a separate line because it’s the largest single cause of fatalities. Unintentional non-transportation includes a number of different categories, like falls or fires, added together. Worldwide road accidents are the greatest killer of people under 25.